Figure 1. 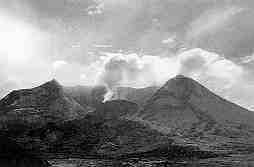 The newest lava dome within the horseshoe-shaped crater at Mount St Helens during its building process in August 1984. Figure 2. 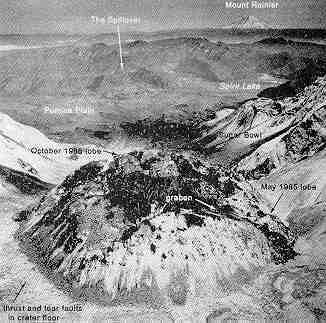 Mount St Helens’ new lava dome is composed of 74 million cubic meters of dacite flows and intrusions built up within the crater between 18 October 1980, and 26 October 1986 The view is toward the north looking over the lava dome into the 1980 blast zone. Figure 3. Blocky surface texture of the east side of the dacite lava dome above prominent talus slope. Figure 4. 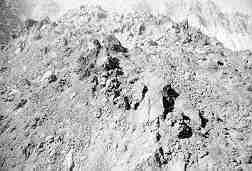 Photomicrograph of Mount St Helens dacite flow of 1986. The most abundant phenocrysts are plagioclase which are embedded in a much finer-grained groundmass containing glass and microphenocrysts. Photographed in polarised light with 2 mm width of view. 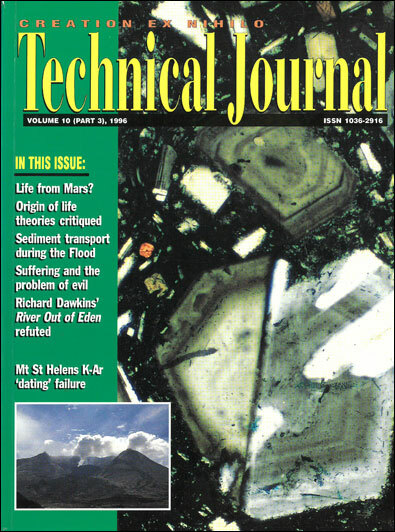 Argon occlusion within mineral assemblages is supported by the data from the dacite at Mount St Helens. Table 3 indicates that although the mineral concentrates (rich in feldspar, amphibole or pyroxene) have about the same ‘Total Ar’ concentrations, the ‘pyroxene concentrate’ possesses the highest concentration of 40Ar* (over three times that of the ‘feldspar-glass concentrate’) and the highest proportion of 40Ar* (40Ar*/Total Ar is over three times that of the ‘feldspar-glass concentrate’). These data suggest that whereas the orthopyroxene mineral structure has about the same or slightly less gas retention sites as does the associated plagioclase, orthopyroxene has a tighter structure and is able to retain more of the magmatic40Ar. Orthopyroxene retains the most argon, followed by hornblende, and finally, plagioclase. According to this interpretation, the concentration of 40Ar* of a mineral assemblage is a measure of its argon occlusion and retention characteristics. 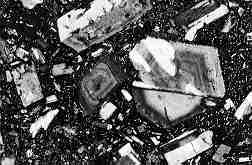 Therefore, the 2.8 Ma ‘age’ of the ‘pyroxene concentrate’ has nothing to do with the time of crystallization.